Dropcam Pro Wi-Fi Wireless Video Monitoring Camera is a one-point solution for all your home and business surveillance requirements. Priced economically and meeting all the challenging requirements by incorporating the latest technology, because this sleek wireless video monitoring camera will never let you down. Beautifully designed camera resembles exactly to that of its predecessor Dropcam HD, also it is easy to mount on the stand and get hooked to the system. You don’t need any special software to install the camera. Simply connect the camera to the PC with the given USB cable and pair the Wi-Fi. After that, the system shall be ready for action. Free Dropcam app with iOS can search for the camera and after synchronizing with the login in Wi-Fi password, the streaming will be ready to monitor on a real-time basis. The video clips are encrypted; if you subscribe to the paid account you will have access weekly or monthly storage options. Quality digital picture and continuous surveillance are the hallmarks of Dropcam Pro. Dropcam Pro Internet Wi-Fi Video Monitoring Cameras help you stay connected with what you love, no matter where you are. In less than a minute, you’ll have it set up and securely streaming high-definition video to you over your home Wi-Fi. Use it to watch your home, your baby, the dog or your small business. Every camera comes with Night Vision, HD video, Two-Way Talk and Digital Zoom. Paired with secure online Cloud Video Recording (CVR), you can watch live and recorded video from anywhere on any device. Dropcam makes monitoring what you love and finding peace of mind easier than ever. Watch from any device such as your Apple Mac, Windows PC, iPhone, iPad, iPod touch or Android device. All you need is a Wi-Fi network to pair with the free and easy-to-use Dropcam App. Watch what you love while away with Dropcam. So many new features are incorporated in the Pro version of Dropcam video camera than its HD version. The events are captured and streamed directly into your mobile or PC by using the free application. It has day-and-night recording facilities. The night-vision facilities are one of the best of its class and also offer your superior digital images. Finally, the two-way communication system allows you to interact without any interruption. Another sterling feature is the field of view, which is enhanced from 107 degrees to 130 degrees that help you to view more area of events. 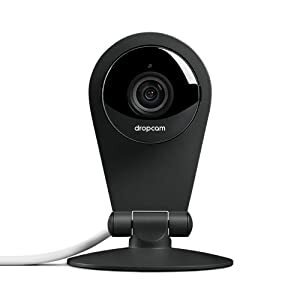 The camera sensors used in Dropcam Pro Wi-Fi Wireless Video Monitoring Camera is bigger than that is being used in iPhone and is good enough to beam 1,920 by 1,080 full-motion video footages. This is considered as the best of its class in home monitoring cameras available presently. The zoom features work well with this camera. The magic wand icon supported by application gives a sharp image of the object what you want to see so closely. Camera: Digital with color and zoom facilities. > Even if you’re not a subscriber, the camera will save your clip automatically. Dropcam is a cloud-based Wi-Fi video monitoring service that helps you stay connected to places, people, and pets. Receive activity alerts on your smartphone, tablet or computer. Add optional Cloud Video Recording (CVR) to access video from the past week or month. The Pro version of Dropcam wireless video monitoring camera is having more advanced features than its HD version. The Pro version is having higher video recording quality than its predecessor and its pictures are much clear. The following are the some of the important advantages of Dropcam Pro Wi-Fi wireless video monitoring camera. It has 130 degrees expanded field view. Audio and motion alert facilities. Finally, the cloud Recording service to save up to 30 days (720 hours) of continuous video. Review footage on your device and share favorite clips with family and friends. Storing recorded facilities are limited through paid cloud service because there are no supporting memory card or third party cloud saving options. Finally, the camera does not have swivel features. Customers are unanimous in saying, “no other camera comes to close the picture quality of Dropcam Pro Wi-Fi Wireless Video Monitoring Camera.” It is a stamping statement to be reckoned for the high-quality digital imagery of the camera. The captured images will be perfectly irrespective of day or night condition, because the purpose of the camera is met. Within an affordable price bracket, this camera offers an acceptable monitoring solution. You will also quite be happy with the enhanced visible coverage of the lens from 107 degrees to 130 degrees. The device is two ways communicative and also having zoomed facilities are made this as one of the most recommended home video surveillance camera. Why should buy a Dropcam Pro Wi-Fi Wireless Video Monitoring Camera? Lastly, the given selling price of contemporary home monitoring video camera, Dropcam Pro Wi-Fi Wireless Video Monitoring Camera is the best choice. The versatile features, hassle-free connectivity, simple to use and operate are one of the best choices for people who are budget-conscious. Since the camera’s lens is having 130 degrees wide angle vision, it can overcome the swivel and tilting limitations. The camera is a top-notch competitor, far ahead than any of the contemporary cameras in recording quality. Its zoom power is twice that of its predecessor and is having the best cloud recording features though it is a bit expensive. Finally, with frequent push alert notification, Dropcam Pro Wi-Fi Wireless Video Monitoring Camera is best option you can have confidently.